For those who know me and my taste in watches a little bit, the fact that I own a TAG Heuer Carrera Heuer 01 typically comes as a bit of a surprise, as there’s a perception that I like the simpler, smaller things in watch life. 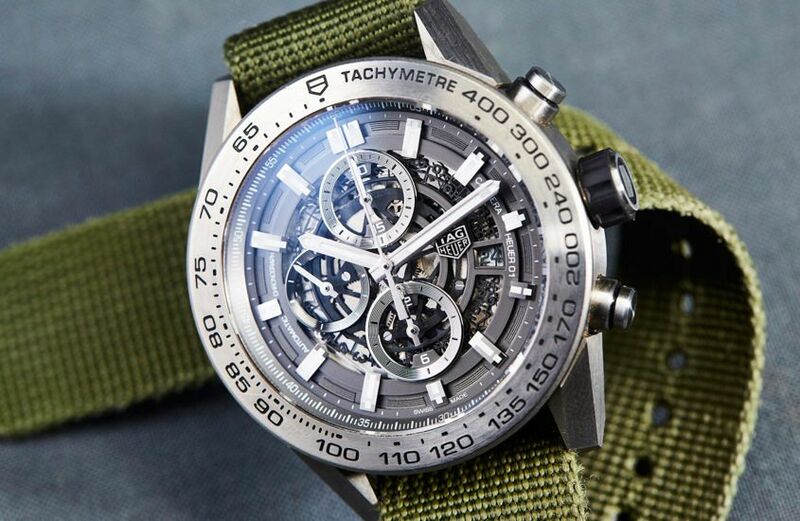 For those who know me and my history in watches a little better, the fact that I’m rocking a big, bold, skeletonised chronograph raises no eyebrows at all. But personal preferences aside, if you’ve ever wondered what it’s like to spend some quality time with the Heuer 01, you’ve come to the right place. My first impression was … whoa, that’s a whole lot of watch. I first saw the Heuer 01 when it was released, back in 2015. 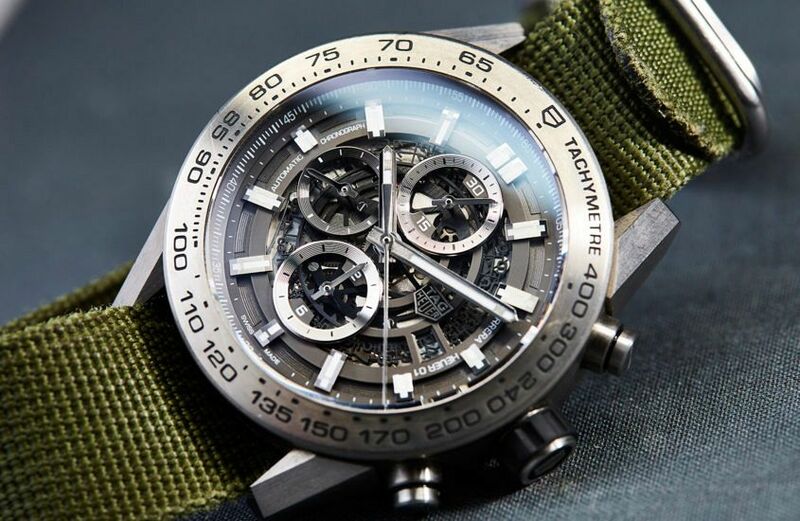 It was a watch that was presented as the face of Jean-Claude Biver’s ‘new’ TAG Heuer, and, boy, did it look the part. Large, modular and aggressively skeletonised. The Carrera DNA was still there, but the Heuer 01 was very much its own beast. And while my original focus was on the ceramic bezel version with red highlights, the watch I ended up strapping onto my wrist was this, the Grey Phantom, which removed any hint of colour, used a titanium case and bezel, and came on a titanium H-Link bracelet. 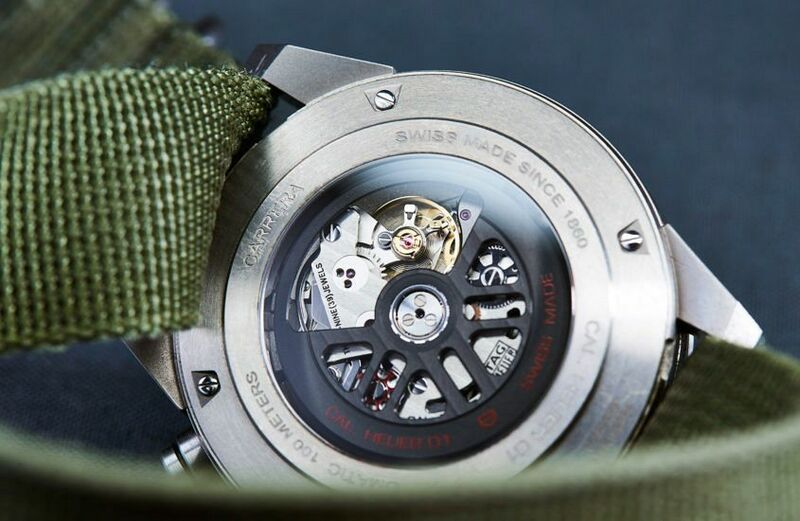 I chose it because I like lightweight titanium on sporty watches, and the monochromatic greyed-out look was cool, stylistically versatile and — dare I say it — subtle. Once I put it on, it felt … far lighter than I was mentally prepared for. Honestly, the weight is a real drawcard for me. 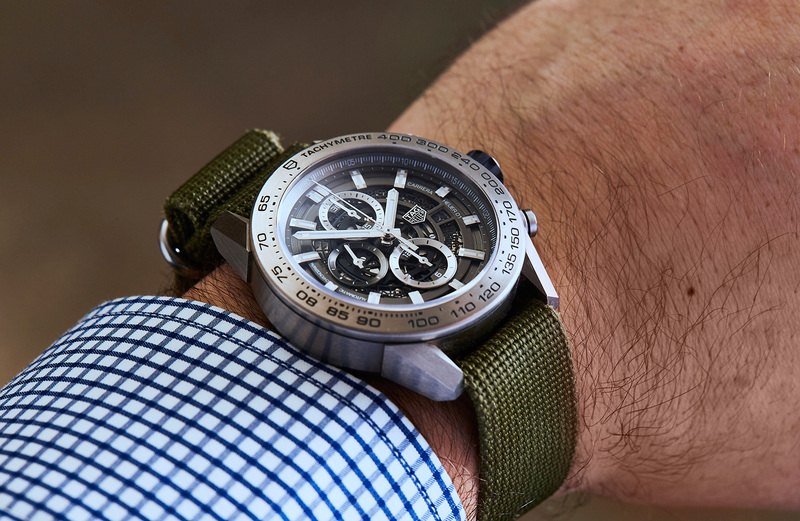 I don’t think that I’d give this watch anywhere near as much wrist time if I’d opted for a steel-cased version. In fact, I’ve stripped the weight down even further, wearing it almost exclusively on a three-ring Zulu-style strap (more on that later), instead of the bracelet. What this combination of large size and light weight adds up to is a watch that, for me, signals fun as soon as I strap it on. That’s not to say that I want to hit the local water park as soon as I’m wearing it (though, with 100M WR, it’s not out of the question) — it’s more of a general lightening of mood. I’d almost go so far as to say it inspires a sense of carefree playfulness. Suffice to say it’s my default weekend watch. 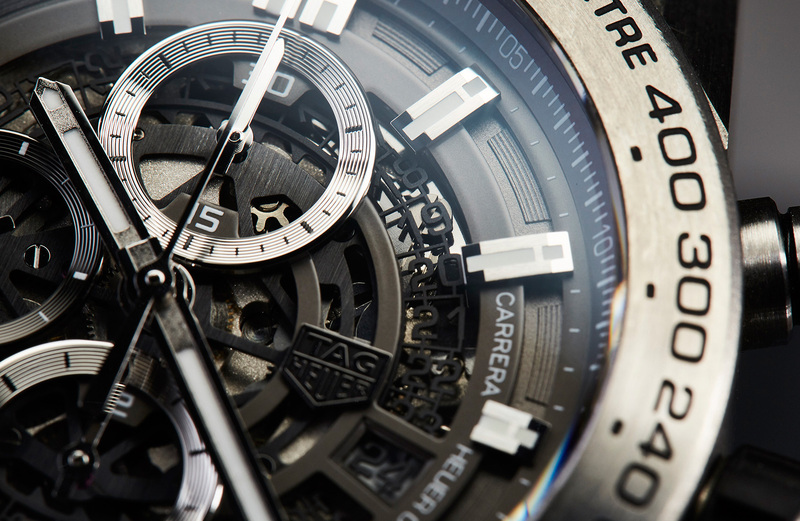 Looks-wise … I like to think this watch has a personality all of its own, even in the (ever-expanding) Heuer 01 family. The grey-on-grey might not be ideal for legibility, but it maximises the textural quality of the watch, which for me is what it’s all about. I also like the fact that this comparatively neutral palette lets me inject colour via the straps. But, honestly, it spends 95 per cent of its life on this worn green Zulu I’ve had kicking around for years. I just think it’s a great casual combo, and even though it might not be an official OEM strap, the fact that during a dinner at Basel it got the seal of approval from one of the guys responsible for designing the watch is good enough for me. What stood out to me … was the height. I think it’s fair to say that most of us think about watches from a top-down perspective; it’s how we check the time after all, and most watch shots are all about that smiling face. And while the dial side of this Heuer 01 has a lot to offer, it’s that 16 or 17mm of height, combined with the short lugs that really make the watch stand tall on the wrist. And while this means that it’s not my go-to when it comes to suit duty, it just amps up the fun factor I mentioned earlier. 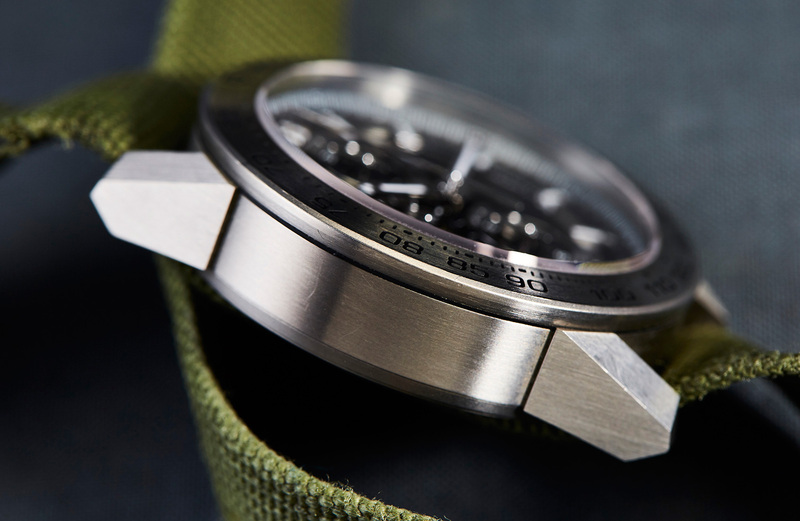 It’s a big watch with a big personality, and unashamedly so. I’d wear this with … casual to smart casual, especially given my chunky nylon strap proclivities. 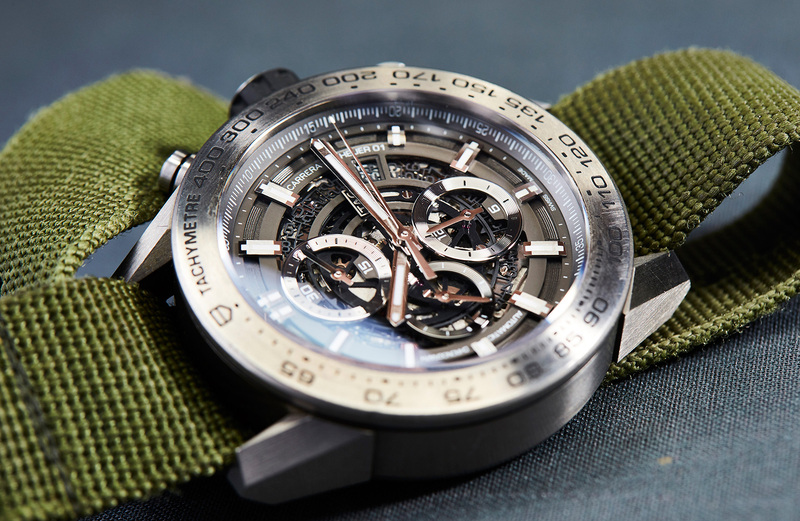 The Heuer 01 is most at home with T-shirts and jeans, street wear and generous cuffs. And I wouldn’t have it any other way. If I could change anything … I must admit that if I was picking this watch up today, I’d be very tempted by one of the slightly smaller offerings. 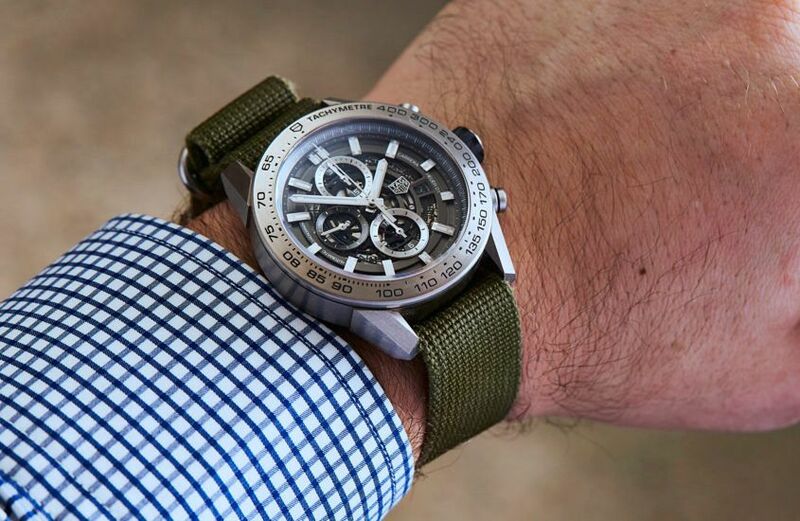 I certainly recommend it to a lot of people with smaller wrists, but I’ve got the wrist that can handle a 45mm watch with ease (it’s a blessing, truly), so I’m pretty happy on that front. The one thing that does niggle in the back of my mind is the fact that the winding crown is inset with rubber. It’s a cool, fusion-y look, and genuinely makes for a more convenient winding and setting experience, but I know that someday, far in the future, that rubber is going to degrade and need to be replaced, and that’s not something I’m looking forward to. One year on … if you look at the pictures of this watch you can see it’s been worn, and well. There’s a few visible scratches on the lugs and the bezel, and while on other watches these marks might stress me out, on the Heuer 01 Grey Phantom they just seem to add to the appeal. I still really dig this watch; it’s great fun. And where’s the fun in being overly precious about your watch? If the purpose of this watch’s design is for it to be worn and enjoyed, then it’s a winning design in my books.